An Alberta woman is the first adult in Canada to be cured of sickle cell anemia with the help of a sister’s love — and a stem cell transplant. Revée Agyepong, 26, of Edmonton was diagnosed with the disease as a toddler and has never known life without it. “I remember as far back as elementary feeling sickle cell complications and not knowing what it was,” she said. Sickle cell anemia is a genetic disease in which red blood cells change into a semi-circular shape and block blood vessels. Symptoms vary from patient to patient but it puts every organ in the body at risk. Agyepong’s disease manifested as chronic bone and joint pain, irregular heartbeat, kidney stones and shortness of breath. Two years ago, the Alberta Children’s Hospital announced it was successfully treating sickle cell disease in pediatric patients using stem cell transplants. Agyepong said when she found out about the success of the treatment in pediatric patients, she was at a point where her health was declining and she was running out of treatment options, but doctors told her she was too old to undergo the procedure. But Stephanie Amoah, Agyepong’s older sister, said she could no longer watch her sister struggle in constant pain and started to research which other centres were testing the treatment on adult patients. “My sister has always been my protector, my guardian, she found a way,” Agyepong said. The sisters approached Agyepong’s doctors and told them of the treatment going on in the east coast of the United States. Dr. Andrew Daly, who leads Alberta’s bone marrow transplant program and oversaw Agyepong’s stem cell transplant, said they had coincidentally been thinking about conducting adult stem cell transplants for sickle cell disease. “My persistence, my sister’s persistence, and they said my dedication to wanting a cure, was enough for them to just say, you know what, she’s going to be the person, let’s do this,” Agyepong said. 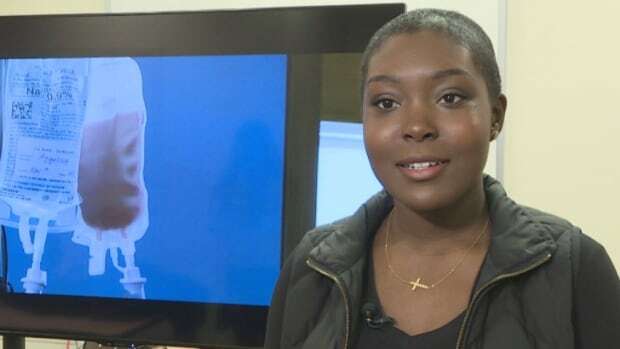 Amoah was tested and was found to be a 100 per cent match for her sister. Daly said the odds of siblings being a perfect match is one in four. The transplant, which took place at Calgary’s Tom Baker Cancer Centre, involved Agyepong taking drugs to suppress her immune system and doing a course of low-dose radiation. Amoah underwent a process called apheresis that collected her sickle-cell-free stem cells, which were then given to Agyepong. Today, Agyepong’s blood tests don’t show any signs of the disease, which makes her essentially cured. Amoah said the change she sees in her sister is amazing. “It’s phenomenal. I’m just so happy to have been part of a process that will give her a new life, a new hope and be able to do the things she’s always wanted to do,” Amoah said. Agyepong said she is still recovering from the transplant but when she is one year out, she plans to dedicate her time to advocating for the disease, and just live her life like a normal person. “I want to travel somewhere exotic and somewhere warm and feel dehydration like anyone else would, because I couldn’t with sickle cell, I would be dehydrated and end up in the hospital,” she said.